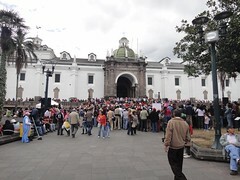 A few days ago we took a 12 hour bus ride from the Ecuadorian coast to the capital city of Quito. We had heard many differing opinions about this city. Some say it’s not worth stopping in, others said they loved it. We agree with the latter. 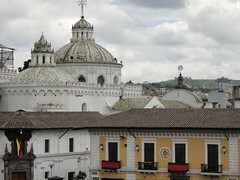 We love Quito’s Old Town which is where we are staying. 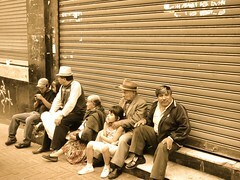 Old Quito is made up of one lane streets and old buildings giving it tons of character. Our first day we decided to take a stroll toward some churches and plazas. It happened to be yet another Ecuadorian holiday, they have one every week. It was fun to join the Quitenos in celebrating their Spanish Foundation. Every other block was flooded with people listening to different bands and watching people dance. 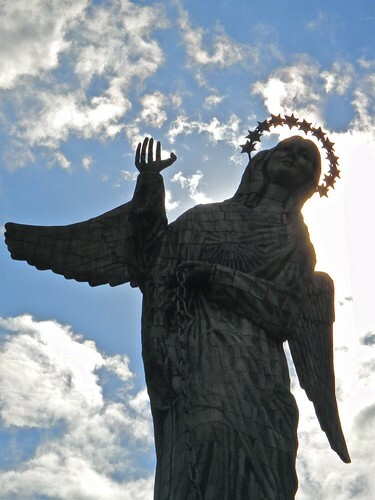 After roaming around for a bit, we jumped in a taxi to visit El Panecillo, this lady. She was high on the hill and had tremendous views. There’s not much else to say, we just took it all in.